← Hunting Johannesburg’s first serial killer. I spent last week embedded with the South African army. Nine SAI, a mechanised division, with whom we ate rat packs, slept in cramped armoured troop carriers and experienced censorship that an African despot would have been proud to claim. I did manage to slip this one past the censors, but for some reason my paper’s online section decided not to publish it. As the tag line goes, this is a home for those orphan stories that didn’t make it to the paper. With mechanised you wake up to the fumes of diesel. A cloud of it hangs above the laager of armoured vehicles, above the cloud there is the splash of the milky way and a moon that will fade when dawn finally breaks . It is day two of the launch of Exercise Young Eagle. This is just the logistical phase and it is complicated. 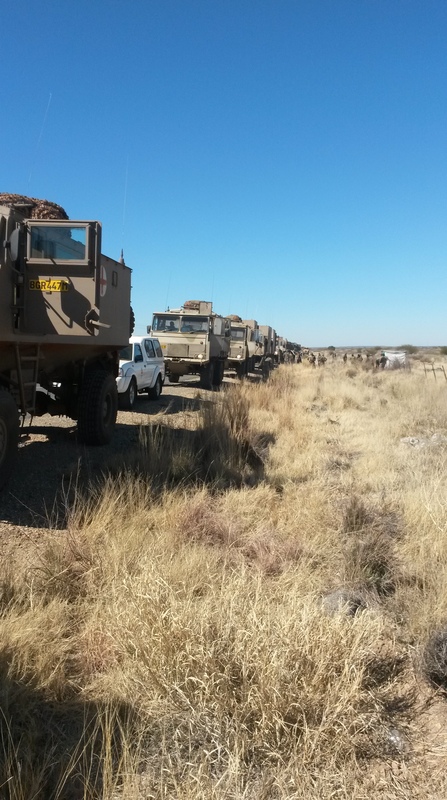 A total of 161 vehicles have to make it from just outside Barkly West, in the Northern Cape to the army’s expansive training area in Lohatla. Getting there means having to keep the civilians happy. So the convoy moves in packets of smaller groupings. The civilians don’t have to wait too long at road crossings and the military can keep moving. A compromise of sorts. There are the big hitters, the Rooikats with their 76mm guns. There are ratels and a vehicle that carries a reputation from the Apartheid days. This is the Casspir, known in the townships back then as a mello yellow, because the police then painted them banana yellow. Today they are SANDF brown and they are troop carriers. Like the troop carriers, many of the men and women who travel in these armoured vehicles are veterans of South Africa’s military interventions over the last two decades. Some have seen action as peace keepers in Sudan, where their armoured vehicles had to engage the technicals or the Landcruisers that the rebels like to use as weapons carriers. The older members of the convoy can remember Phola Park and Khumalo street, from back in the early 90s when the ANC and Inkatha fought each other on the East Rand of Johannesburg. But now both old and new of the SANDF are heading to an exercise that will test the army of the 21 century. They find out how well they can evade electronic snooping aircraft and prepare for war further up in the African continent, where they could be called at any time. This entry was posted in journalism, Media and tagged Casspir, Lohatla, Nine SAI, Ratel, Rooikat, South African army. Bookmark the permalink.